Solenoid valves provide a practical means of electronic control for the flow of liquids and gases. With hydraulic and pneumatic applications spread throughout industries from automotive to food service, these devices play a massive role in modern mechanics. In order to better understand their function and terminology, we have laid out some of the basic concepts in plain terms. Understanding these 4 categories of characteristics will create a foundational knowledge of solenoid flow control useful in any field or application requiring electronic flow control. When describing the function of the solenoid valves, normal refers to the unpowered state. Actuating the solenoid will create the inverse state. In cases where solenoid function is proportional, the change in states may happen in degrees. Poppet valves utilize a passage cover which is held in place by a spring or the pressure of the medium flowing through the valve. The solenoid alters the position of the poppet either directly or by use of a pilot (described below), which opens or closes the passage. Poppet valves allow for higher flow rates but actuation force of the solenoid must be higher than in spool valves to accommodate for the pressures acting upon the poppet. Spool type valves have seals along the bore of the spool. As the solenoid influences the position of the spool, the alignments of the seals change to stop or allow flow. Spool type valves have less surface area that is influenced by the pressure of the flow, so they can be actuated using less powerful solenoids. The drawback is that they also have a more limited flow rate. Direct acting solenoids influence the flow of the medium by directly altering the position of the poppet or spool to open or close the valve. Direct acting valves are fast and have simpler design principles but are less capable in high flow applications. 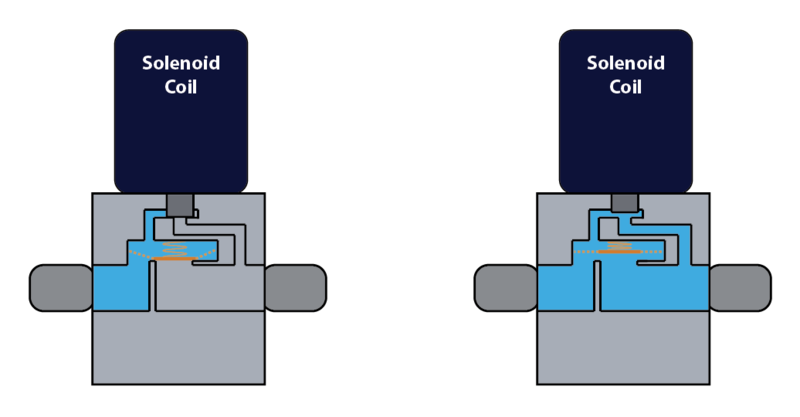 Pilot operated solenoid valves have a poppet or diaphragm that is held closed by a spring and the differential pressure between the inlet and outlet ports. A smaller secondary channel links the inlet and outlet ports on either side of the poppet. The solenoid controls flow through this secondary channel, and when it is in the open state it allows a small amount of the medium to flow to the outlet port which begins to equalize the pressure acting on the poppet until it opens and allows for full flow. Pilot valves are slower than direct acting valves but allow for a smaller solenoid to control higher flow. Flow rate is controlled by a valve between the inlet and outlet port. Most 3 way valves use 1 port as an inlet and 2 as outlets. The solenoid is used to direct inlet flow to the desired outlet port. 3 way valves can also use two ports as inlets and a single port as an outlet, to accomplish mixing functions. A 4 way valve has 4 or 5 ports. There is 1 inlet, and 2 outlet ports much like a 3 way valve but whichever outlet port is off becomes a secondary inlet port that routes the flow to the final 1 or 2 exhaust ports. Some 4 way valves also have 3 way positioning. 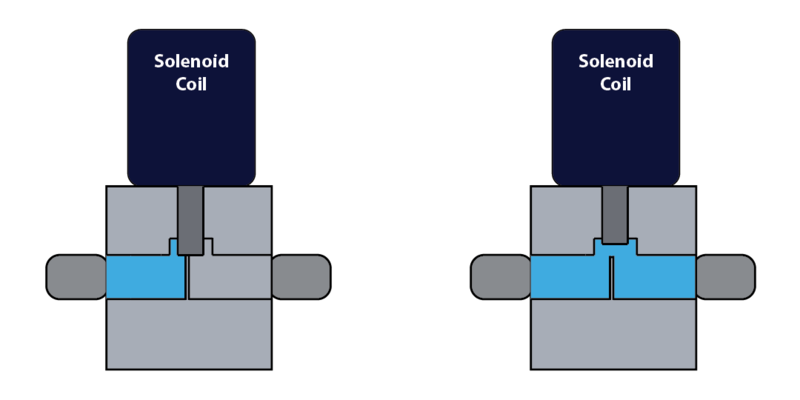 Instead of choosing between two paths of travel (2 way positioning) as shown in the diagram below, the solenoid is also capable of a third position that blocks all fluid from travelling through the valve to maintain the pressure in the loop.